In front of the high altar in the crowded chancel of St Mary’s church, Bottesford (Leicestershire) stands the tomb-chest of Thomas Manners, 1st Earl of Rutland (d. 1543) and his second wife Eleanor Paston, daughter of Sir William Paston of Norfolk (fig 1). The monument is of exceptional quality, and due to the survival of the extensive Belvoir Castle records, it is known to be the work of Richard Parker of Burton upon Trent (Staffordshire). This is the only documented work by Richard Parker “the alabasterman”, and as thus is an important source of information on the work that he was producing in his workshop in Burton upon Trent during the mid-sixteenth century. The records show that Parker was commissioned to produce the sculpture and oversee its setting up within the chancel of St Mary’s church, along with John Lupton and his father, two local masons who were employed to undertake other elements of the work, including the strengthening of the floor in order to take the weight of the monument. The survival of both the documentation and the monument is important and allows us to produce a list of other stylistically similar monuments that can be attributed to Parker’s workshop (see Bayliss, J., 1990). Parker was paid £20 for his work. 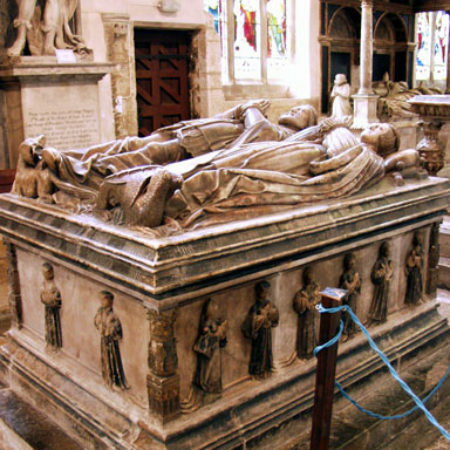 The monument to the first Earl was the first burial within the chancel at Bottesford, and it was he who was responsible for having the monuments to his ancestors moved to Bottesford from Belvoir Priory and Croxton Abbey at the dissolution. The chancel of the church at Bottesford houses a fabulous collection of monuments to eight Earls of Rutland from 1543 to 1679. 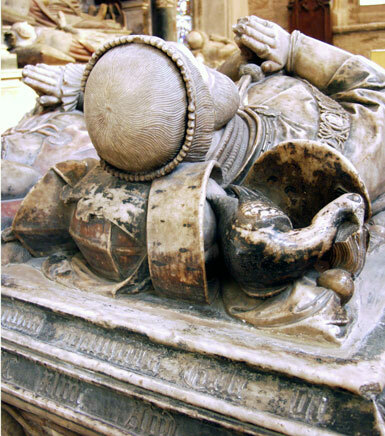 The first Earl’s monuments stands at the centre of the chancel and is overshadowed (in more ways than one) by the imposing monument to Francis Manners, 6th Earl of Rutland, KG (1573 – 1632), the ‘witchcraft’ tomb. Thomas Manners was the son of George Manners, 11th Baron de Ros of Helmsley and his wife Anne St. Leger, the daughter of Richard Plantagenet, 3rd Duke of York, he therefore had connections through blood to Edward IV and Richard III, and through marriage to Henry VII, Henry VIII, Edward VI, Mary I and Elizabeth I. Thomas succeeded his father as 12th Baron de Ros at his death in 1513. 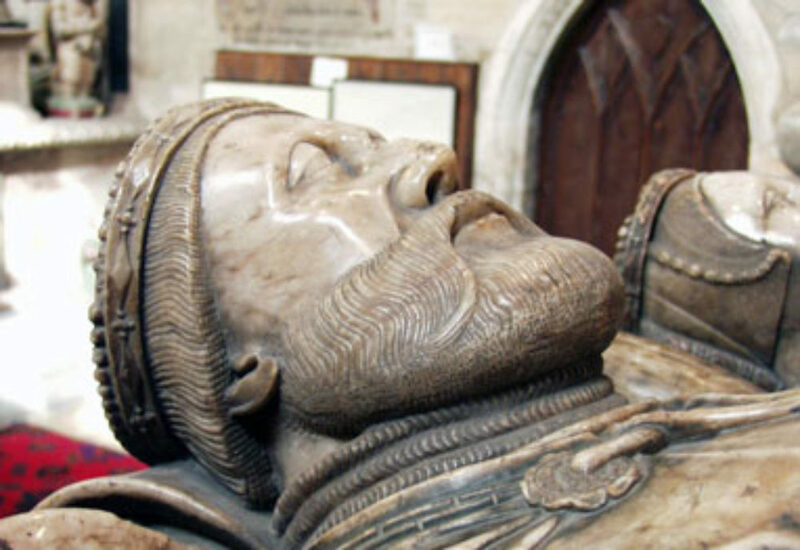 His father’s monument is also a product of the alabaster workshops of Burton upon Trent, and stands in the Rutland Chantry Chapel at St George’s Chapel, Windsor (Berkshire). As well as being Baron de Ros, Thomas Manners was created the 1st Earl of Rutland by Henry VIII on 28th June 1526. 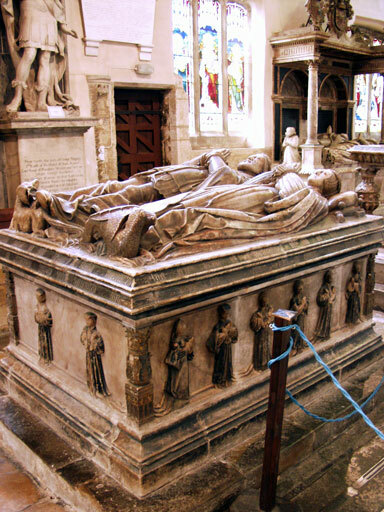 The monument consists of an alabaster tomb-chest with recumbent effigies of the Earl (fig 2) and his wife, with figures of weepers around the sides of the chest. There are the beginnings of Renaissance details appearing on the monument; however the style and the lettering are still entirely in the medieval tradition. 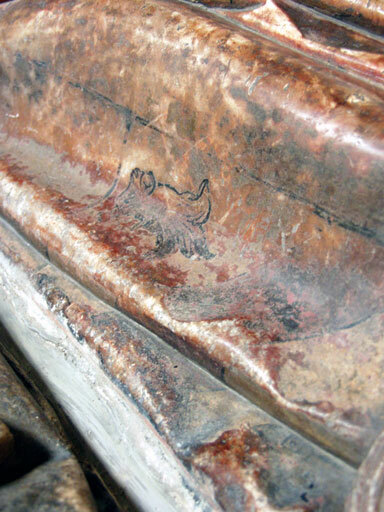 This was to be an element of the work produced in Burton upon Trent until the end of the sixteenth century. The Earl is shown in full mail and armour with a tabard, over the tabard he wears the mantle of the Order of the Garter. 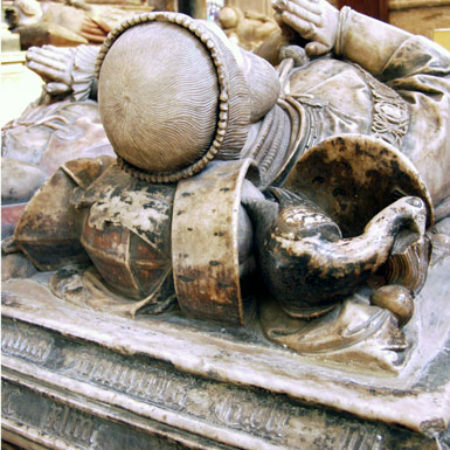 He wears a coronet and his head rests on a tilt-heaume, which is complete with the ‘Cap of Maintenance’ and Peacock (fig 3). His feet rest against a Unicorn. The countess is shown wearing a long gown and cape, whilst her feet rest against a Griffon. 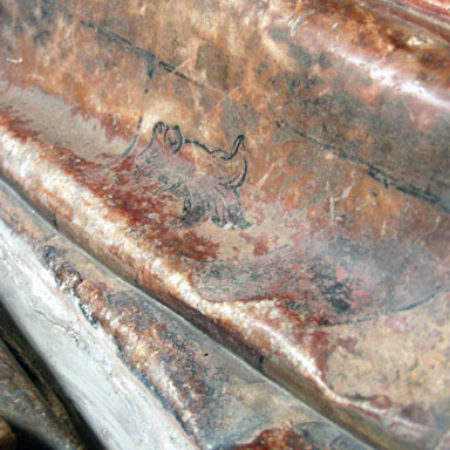 The whole monument would have originally been highly decorated, and traces of the original colouring can still be seen, especially on her dress (fig 4) and on the Peacock head-dress on his helmet. As well as documenting the construction of the monument, the Belvoir Castle records describe in detail the care that was taken of the Earl’s body to preserve it prior to the burial. Initially the body was embalmed with spices from Nottingham, and then a surgeon encased it in wax. Following this a plumber was employed to encase the body in a close fitting lead shell. 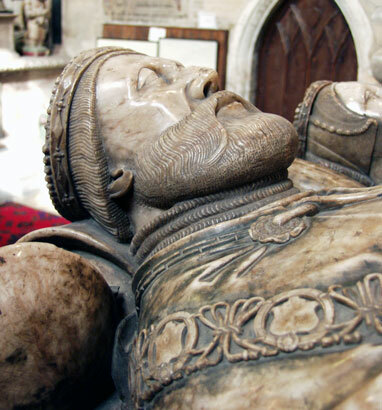 This fabulous mid-sixteenth century monument and its associated documentation allow us to develop a greater understanding of the processes involved at the time, whilst allowing the study of the products of a high quality alabaster workshop in the midlands. It also stands as the initial phase of the development of the chancel of Bottesford church by successive generations of the Manners family as a spectacular collection of the monumental masons’ art.